A daily shot of a mixture of Reishi mushroom, Elderberry flower, Burdock root tinctures and honey keeps me healthy and knocks out anything trying to pull me down! This combines the anti-cancer, anti-viral, and anti-fungal powers of Reishi mushrooms, the immune system strengthener of elderberry, and the general adaptogen and blood/liver cleaner of burdock root. Honey is antimicrobial and a soothing agent. 1. Finely dice enough peeled, fresh burdock root to fill a quart jar 3/4 full. 2. 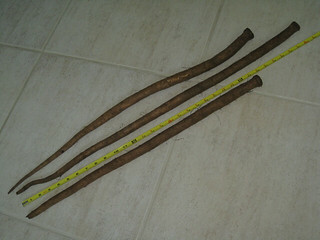 Add enough 100 proof vodka to cover burdock root 1/2 inch deep. 3. Soak for six weeks, shaking twice daily. 4. Strain out solids, place in a tightly capped jar and store in a cool, dark place. 1. 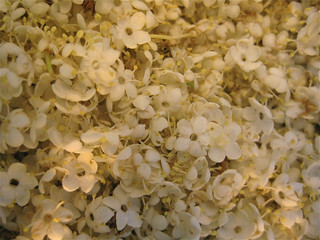 Fill a 1 quart canning jar 3/4 full with fresh elderberry flowers (no stems!). 2. Add 1 tablespoon of honey, two shots of Triple Sec orange liquor and fill most of remaining space in jar with 100 proof vodka. 1. Finely dice fresh Reishi to 3/4 fill a PINT jar. 2. Add enough 100 proof vodka to cover Reishi 1/2 inch deep. 4. 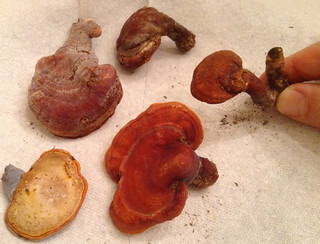 Stain out the Reishi mushroom pieces and boil them for 10 minutes in water equal to the volume of vodka you used in the second step. 5. Allow water to cool, then strain out Reishi, discarding the mushroom bits. 6. Add fresh water to replace any that evaporated during boiling. 7. Combine mushroom extract water with mushroom extract vodka. Some solids will appear. You want these along with the vodka/water. 8. Place in a tightly capped jar and store in a cool, dark place. 1. 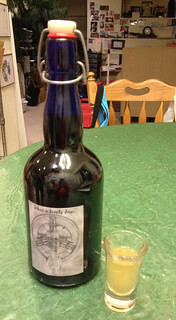 Combine 2 pints Burdock tincture, 2 pints Elderberry Tincture, and 1/2 pint Reishi Mushroom tincture. 2. Add 1.5 pints of honey (making the final blend approximately 1/3 honey), it may take a few days to dissolve into elixir. 3. Shake well before using. One shot a day is what I take but keep in mind I'm a 6'5", 240 lb, 50 year old male who works out and lives a somewhat insane life. I can't tell you what sort of dosage you should take.